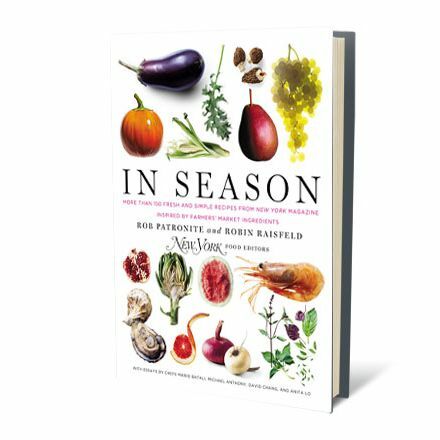 On October 25, New York will release the In Season cookbook by food editors Rob Patronite and Robin Raisfeld. In addition to more than 150 recipes from chefs such as April Bloomfield, Damon Wise, Jonathan Waxman, and Andrew Carmellini, the book also features essays by Mario Batali, David Chang, Anita Lo, and Michael Anthony. 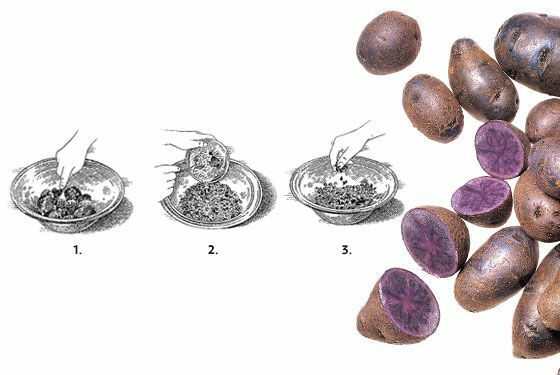 In fact, to give you a sense of what to expect, you’ll find Anthony’s introduction to fall, as well as his recipe for purple majesty potatoes — both of which are right from the book — straight ahead. As a cook, I feel anticipation and rebirth through spring and exuberant celebration in summer, but my favorite season, autumn, brings on a contemplative reverence. Fall continues what the heat of summer put in motion: the explosion of peppers, tomatoes, eggplant, corn, beans, berries, cucumbers. The Harvest! There is balance in the air. The intensity of the sun fades and provides those perfectly long days that begin and end in coolness. We cook with a feeling of abundance. As fall progresses, the moon grows bright and we get a glimpse of sadness, a need for comfort, an uncertainty in the air, a warning that this won’t last forever. One last bite that might be the best of the year since we know it will be another twelve months until we can taste that flavor again. Not only does the Purple Majesty come in a shade of violet so striking that even Prince would say it is a bit much, it’s also really good for you. The potato was developed in 2006 by Colorado growers using natural cross-breeding techniques that somehow resulted in a superspud containing freakishly high amounts of antioxidants. They’re great fried, but Gramercy Tavern’s Michael Anthony recommends a simple method inspired by a guest-chef visit from the late, great Bernard Loiseau. The backstory: At first, Anthony couldn’t believe that Loiseau had traveled all the way from France to crush potatoes with a fork. But when he saw the intensity with which the Frenchman approached his task, and how much attention he lavished on such a humble ingredient, it won him over. A smashing tip: never overwork the potatoes; use a crushing, not a mixing, motion. In a large pot, cook potatoes with skins on in heavily approximately 15 minutes. Remove potatoes from pot, and peel them while still warm. Place potatoes in a large bowl and, using a fork, gently smash them, maintaining a fairly chunky consistency. Fold in minced shallots, lemon juice, olive oil, fleur de sel, and white pepper. Finish with parsley. Serves 4.